A small yet relatively bright constellation in the night sky, DELPHINUS the Dolphin is mainly a Northern Hemisphere constellation best seen in the summer season. Cygnus the swan, the previous constellation post on The Little Astronomy Blog, is in the same geographic vicinity as Delphinus. Geographically speaking, Delphinus is typically seen northeast of Aquarius the water carrier, west of Aquila the eagle and Sagitta the arrow, south of Cygnus and Vulpecula the fox, east of Equuleus the little horse (foal) and Pegasus the flying horse. The constellation image of Delphinus is comprised of five main stars. 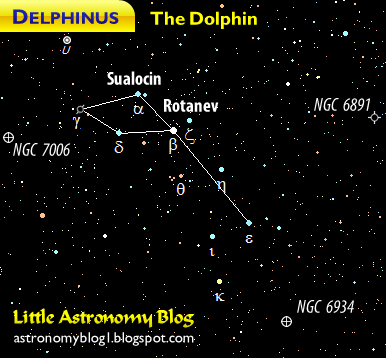 The brightest star is Rotanev, shining in the dolphin's torso with an apparent magnitude slightly over 3.60. As written below, Delphinus features multiple deep-sky objects such as nebulae, galaxies, and globular star clusters. One interesting celestial sight in Delphinus is ZW II 96, in which two young galaxies are merging. This and other ZW-designated celestial objects are part of the Zwicky Catalogue of Galaxies. Base Map derived from Planetarium (software), version 1.8 (© 1998 JC Research, Toxsoft).